What Is Lurking in Your Ductwork? It’s hard to say “it’s cold out” and not feel a little guilty, considering what Midwest residents have been dealing with lately. But, let’s face it, around here our baseline temperatures for summer is so high that when winter hits, it does feel cold to us! At least, cold enough to use our furnaces on a nightly basis for at least a couple of months. Yet, temperatures are warming again, and that ever familiar humidity is rising, which means it’s almost time to shut off our furnaces for good this season in favor of our AC systems. This doesn’t mean you should just forget about your furnace until next year, however! If you were alerted to any repair needs during your pre-season maintenance appointment, or if you detect signs of disrepair, now is the time to call our pros for an inspection. But, what exactly are the signs that you need heating repairs? Unless you’re told you need repairs by an HVAC professional, it can sometimes be hard to figure out if it’s time to call for a repair. The following signs are definitive indications that it is, in fact, time. Your heater is making strange noises, like groaning, banging, whining, or hissing. The heat isn’t at the level it used to be. Your energy bills seem higher than they should be, despite comparable use to last year. Your gas-powered furnace’s pilot light is burning yellow. The furnace is struggling to turn on or stay on. The furnace keeps running without shutting off. What Causes These Repair Symptoms? The symptoms we described above are indicative of a number of different possible furnace repair needs. It may be an issue with your thermostat, for example, and not a problem with the actual heating system at all. If this is the case, while this is a comparatively minor and inexpensive repair need, it’s still one you want to take care of right away as it will affect the use of your air conditioner, too. 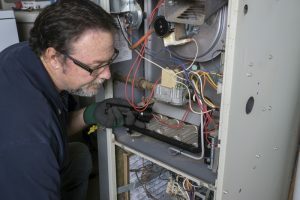 Other potential furnace repair needs that may cause these symptoms include breached and leaky ductwork, clogged up air filters, or an electrical fault in the heater’s mechanical system. Ignoring any sort of problem with your furnace can result in the problem growing worse, and you could very well find yourself with a broken down or ineffective heater next year, right when you need it the most. You sure can. As we alluded to above, an important part of furnace care is scheduling pre-season maintenance. It’s during this maintenance session that our technicians will thoroughly inspect your furnace, checking for any of these signs of disrepair. We’ll also clean the system and make any adjustments that are needed. We recommend this service pre-season so you don’t have to worry about an interruption in service, but what’s more important is that you have it done each year. So if you didn’t have maintenance done before this winter began, it’s not too late! An end-of-season tune-up is better than no tune-up at all. At North Central Florida Air Conditioning, we are “Improving Lives by Improving Homes,” throughout Gainesville, FL and the surrounding communities. Contact us today for expert furnace repair and more!